Run across Hoover Dam and stop for the perfect photo op on this trail run from Las Vegas. 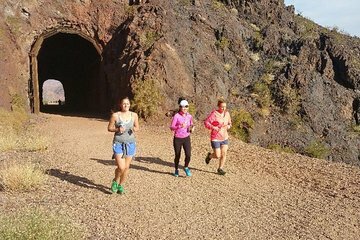 Start your 8-mile (13-km) run at the Historic Railroad Tunnels trailhead, which follows an old railroad bed in Lake Mead National Park. Follow your guide through five tunnels dug into volcanic ridges, delight in vistas of Lake Mead and search for bighorn sheep. This 4-hour running tour includes refreshments and hotel transport.